I've made it a habit, more mornings than not, to walk over the Brooklyn Bridge, do a lap around the City Hall Park Fountain, and walk back to Brooklyn, perhaps extending my walk by going left after descending from the Bridge walkway toward DUMBO, there to get some croissants, and maybe a baguette, from Almondine. 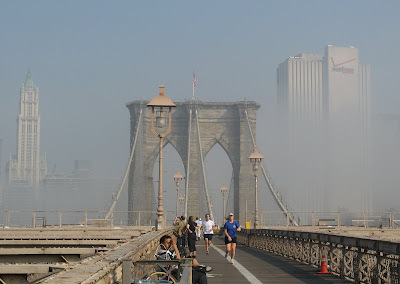 This morning, there was heavy fog at water level up to above the level of the Brooklyn Heights Promenade. When I got up onto the bridge, I was above the fog. Here's the scene looking towards Manhattan, with the unlovely and unloved Verizon Building to the right and the lovely and much loved (even by James Joyce) Woolworth Building to the left. Clinton concedes; Collins comments cogently. For all [Clinton's] vaunting ambition, she was never a candidate who ran for president just because it’s the presidency. She thought about winning in terms of the things she could accomplish, and she never forgot the women’s issues she had championed all her life — repair of the social safety net, children’s rights, support for working mothers. Update: Towards a more colorful vocabulary. Reading the comments on Twiffer's article, I learned that arugula is also called "rocket". I can't wait for my first opportunity to ask for a rocket, Bartlett pear and gorgonzola salad. So sad that it's come to this. As we anticipate the passing of this kidney stone of a Democratic primary campaign, Rumproast dubs HRC "Sen. Veruca Rodham Salt". Update: Relief may be in sight. I'd like to think that Buddy, the Bopper and Richie (not to mention the King, Eddie and good ol' Roy) were tuning up, getting ready for a jam to rock the cosmos. Fleetwood Mac: "Buddy's Song". From Kiln House, an album I love that was critically panned--one scribe called it "Buddy Holly-obsessed" (although it includes no Holly covers). This is the second best Buddy Holly song not by Buddy Holly. According to the playlist on the vinyl album, the song was written by Ella Mae Holly, but the notes to the CD indicate it was penned by then Fleetwood Mac guitarist Jeremy Spencer, and "generously credited to Holly's mother". Bo: Where are you from? Bo: You don't look like no South American to me. Jerome: I'm still from South America. Tom Rush: "Love's Made a Fool of You". A snappy cover of a lesser-known Holly song by one of my favorite 1960s vintage folkies, and a Hah-vahd man to boot. If I had to choose a theme song for my life, this might be it. Buddy Holly: "Everyday". An inspiring song for people whose theme song is the above. Blondie: "I'm Gonna Love You, Too". From the killer Parallel Lines, a hyperkinetic rendition of another lesser-known Holly song.